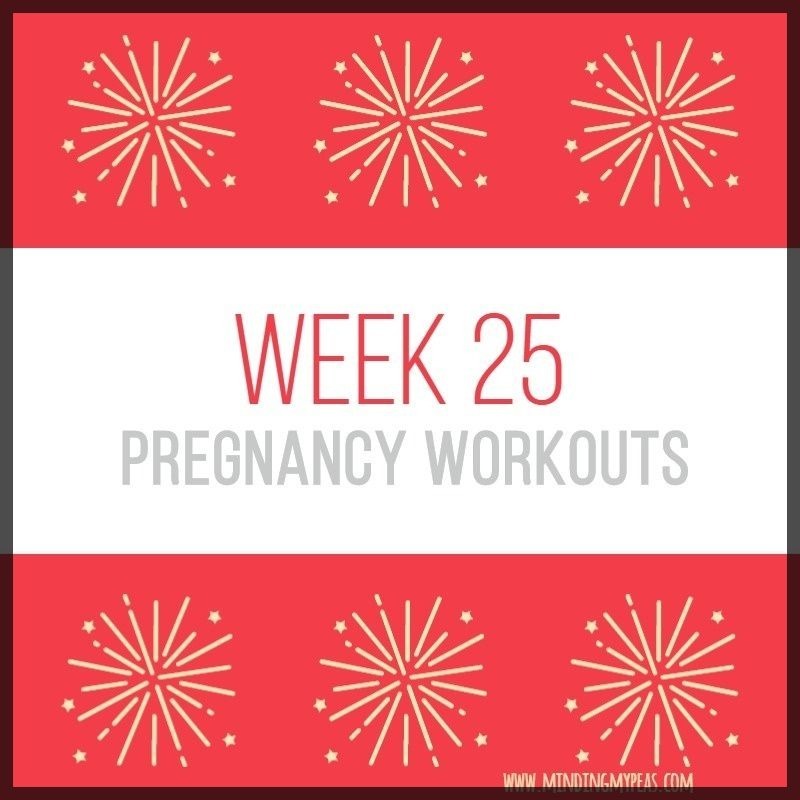 This week I’m sharing what I’m doing for a free fit pregnancy. I am all about exercising (pregnant or not) AND I’m all about doing it for free. As a homeschooling mama with 3 other kids, there is not enough time in the day to be trying to get to the gym every day. And I wouldn’t want to pay for it if there was. So I do all of my workouts from my living room. I’m using a random assortment of prenatal and regular videos, but it works for me so maybe it will work for you! Oh, and they’re all free! There are so many great workouts on Youtube for free. I do have a Prenatal Barre DVD by Suzanne Bowen that I use as well. Frankly though, I cannot do the exact same workout every day in a row. It’s just too boring. This week was the 25 week mark in my pregnancy (only 15 weeks to go!). My low back and hips get angry with me pretty easily these days, so I don’t do a lot of jumping. If there is jumping in a workout, I take all the impact out of it and just practice a controlled tip-toe hold through what would be the jump. Sometimes I’m feeling pretty good and jump anyways, but it always ends in my hobbling around like an old lady by 7PM. I should really just learn already… Also, obviously, I’m no longer laying on my stomach for things like back bows. I modify those by performing as near to the exercise as I can while standing, or doing a variation (bird-dog > backbows forever). I also don’t lay on my back for extended periods of time, but I will do the occasional stretch. That’s about it as far as modifications go. Let’s get into the workouts! Today I did this Fitness Blender At Home Cardio Workout for People Who Get Bored Easily, with lots of additional freestyle stretching at the end. I stuck with my 10lb weights (20 lbs total) through this workout for the most part, although I think for one of the squat sets I dropped one and just held the other goblet style. No other modifications though! I added a warmup first and cooldown/stretch after. 35 minutes total, but this video is only 26. I did the Upper Body and Core segment from this DVD. It was a shorter workout than I’d like, but I had run out of time that morning and needed to just get on with the day. I did more stretching and a power hour of cleaning later. Does cleaning count if you work really fast? Definitely not the best workout day I’ve ever had, but I did try to get my heart rate up. Another Fitness Blender today. I like Fitness Blender alot, y’all. This standing abs was great, relatively pregnancy friendly core work. I didn’t have to modify this one hardly at all, except for the standing toe touch crunches. Toe touching is just not happening over the belly these days. Also, it made me surprisingly sore. The X Pivots and Bent Over Back extensions actually really did a number on my hamstrings. 35 minutes, plus stretching. I had planned to make Friday a really good cardio/total body strength combo to finish out the week and earn my pizza/weekend treat, but I was so sore from the standing abs thing that I had to opt for yoga and a little bit more Fitness Blender in the form of upper body strength. I’d like to think I’ll do a hard workout tomorrow to make up for it, but I’m more likely to take a walk and call it good. I didn’t have to modify much in the upper body one, except for the back bows and skull crushers. Instead of back bows, I did bird dog; Instead of skull crushers, I sat up and did an overhead tricep extension. Alternated between my 10lb weights and the 5lbs depending on the exercise. That’s that for this week! Disclaimer because that’s what you do these days: I am not a medical professional, and you should always consult yours about your exercise habits, especially while pregnant! Every body is different!